Today we get to be voyeurs as we stare at Aljur Abrenica‘s wonderful physical features in a lecherous manner. It has been a while since he was featured here. These days, he’s back working on tv, which translates to more shirtless scenes on cam to complement his exceptional thespian talents. Like a gallant battle-weary hero back from a long war, Aljur Abrenica strode across the asphalt walk, from a horse and free of shirt, of course, to the welcoming arms of his new network’s happy execs. We wish him the best – meaning, more shows, less BV – and lots of sweaty nakedness in ABS-CBN. Aljur Abrenica is getting hitched and we’re having mixed reactions. Will he get a dad bod? Will he give up taking his shirt and shorts off in the name of hotness? One thing is for sure, though: we love to see him naked and he’s better off sans clothes. Daniel Matsunaga is single! Maybe he’ll go back to his baring and daring days. Maybe he’ll show more skin this time. Because he’s a beautiful boy with a to-die-for body. It’s such a waste to cover all that with clothes and all. Not that I need to expound further on his enviable assets. Seriously, it’s like you’re photoshopped! That’s Mr. Philippines, Joseph Doruelo in the waters of Pattaya for the Mister Global competition. With insane hips and odd cuts, the registered nurse from Caloocan City hopes to win the international title (following the footsteps of his winner in the national pageant, Neil Perez). And while no one was looking, Aljur Abrenica quietly slipped back into the loving arms of the station that discovered him. After his falling-out with GMA – with tales of being sexually exploited and all – the young hunk is back, promising to be a good boy to bare more this time. I’m delighted, of course. Never mind that our favoritest Aljur is a hunk of contradictions. Remember, he quit his management team because he felt exploited with all the baring and daring? That he’s always required to take his shirt off to show his hidden talent/s? He’s still at it, of course. Because he can never hide those assets for long! And you still haven’t identified the cute “macho dancer” for me! Here’s one more photo to help you. 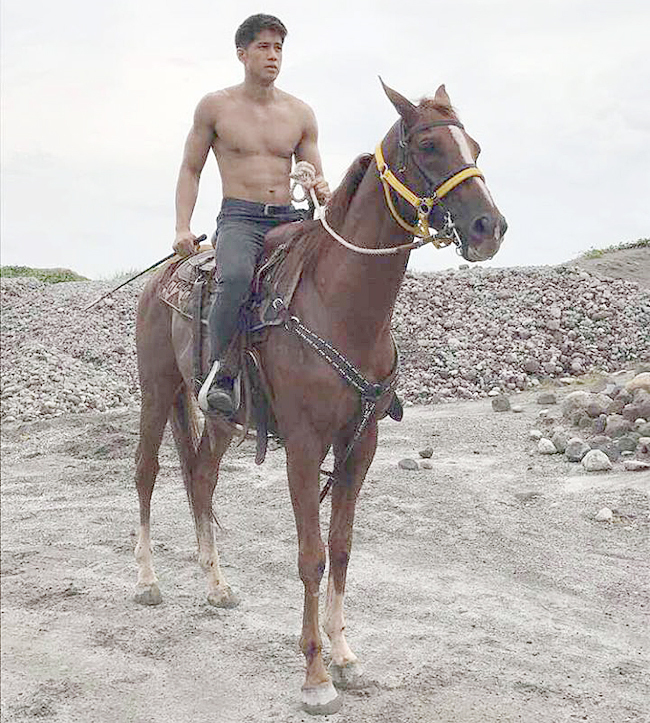 Although Aljur Abrenica‘s no longer in the A-list after his near-miss at the top in GMA, he’s showing us he still has the goods to be a leading man. Good looks and ripped bod and a bit of acting chops. He’s languishing in TV hell these days, as he now accepts bookings for celebrity basketball games, ribbon cutting for salons, and personal appearances (shirtless!) in small bar shows. New Aljur picture, but what’s new with the hot hunk of GMA? I’m pretty sure the Aljurtards out there will react violently, but after all is said and done – Is it really the end of the freakin’ line for Aljur? He’s not doing anything, for crying out loud! No movies, no tv shows. Is his star really fading? As further proof of gross mismanagement, just recently, due to another mishandling by GMA of a fashion show for leading apparel brand Bench (Suyen Corp.), which became a comedy of errors on top of a communication breakdown, ALJUR lost his endorsement contract with the said brand. Thus, sometime in January 2014, Bench once again offered ALJUR an endorsement contract. GMA wanted to get on the good side of Bench thus asked ALJUR to sign a Bench Body contract along with the Bench apparel contract. The agreement was for ALJUR to do a campaign wearing only his underwear. ALJUR, as usual, was not comfortable with the idea but was convinced to submit because he was told that if he signed up, GMA would ensure a big launch with the decency and formality as that of Dingdong Dantes, another GMA talent, when the latter did a similar campaign for the same apparel company. As the shoot date scheduled on 12 July 2014 approached, ALJUR requested for the specifics of the shoot, including the kind of underwear he was going to wear, and whether the “Dingdong-type” launch was going to happen. GMA could not give him an answer. ALJUR kept following up his request for weeks before the shoot but to no avail. On 11 July 2014, a day before the shoot, GMA still withheld the “pegs” to ALJUR despite his assiduous demand and no information about the launch was conveyed to him. Due to the uncertainty of what was going to happen in the morning, ALJUR requested from the Artist Center that the pegs or the actual underwear be sent to him, and the kind of launch that will be had be confirmed not later than 9:00 o’clock that night, because he wanted to sleep early so as to look his best should the shoot proceed. At 10:30 of that same night, however, ALJUR’s Artist Center Manager, Tracy Garcia, informed ALJUR that his contract with Bench was cancelled without giving ALJUR any clear reason.